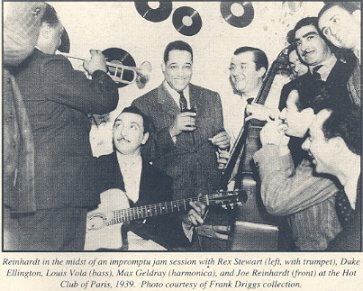 AIthough the Selmer guitar company made a wide variety of instruments, including harp guitars, various styles of classical guitar, four‑string tenors, and seven‑string Hawaiian models, it is primarily known for the Modele Jazz made famous by Django Reinhardt. Selmer produced about 900 guitars between 1932 and 1952, about half of which were built in the oval‑hole, Modele Jazz style. The Modele Jazz has laminated Indian rosewood back and sides, a solid spruce top, an ebony fingerboard, and a walnut neck with a grafted headstock. Its unique features include a very long, 26½ -inch scale length and sealed gears, which were invented by Mario Maccaferri, the man who designed the original Selmer guitar.As part of his endorsement deal with Selmer, Reinhardt was allowed to take a guitar from the builder's showroom every now and then, which he would later sell or give away to friends or family. Because of this, nearly everyone who owns a Modele Jazz believes that it once belonged to Reinhardt, even if he only had it for a couple of days. Of all the Selmers said to have been Reinhardt's, only two come with proof. The first is #503, which Reinhardt picked up in 1940 and used until his death in 1953. Reinhardt's son Babik played this guitar until his mother donated it to the Musée Instrumental de Paris 1964. The other is #704, the guitar pictured here. This is the only instrument the Selmer logbooks show as baving been shipped to Reinhardt (even if his name was spelled "Django Raynal" by the Selmer clerk who logged it in).Reinhardt picked up this guitar in 1948 just before a tour of Italy, during which the originai top was crushed. An unknown Italian luthier replaced the top, using a round soundhole rather than Selmer's distinctive oval. 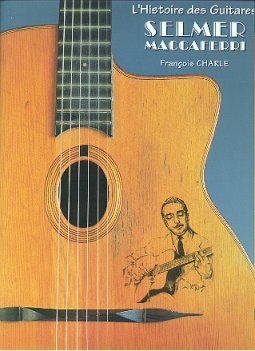 Reinhardt gave the repaired guitar to his partner Stéphane Grappelli, who in turn gave it to an Italian friend. 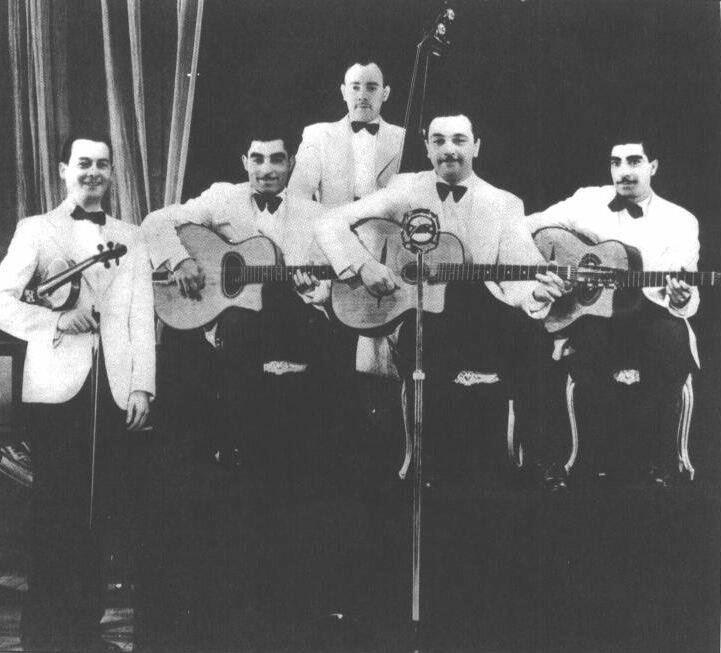 The guitar remained with Grappelli's friend in Rome until it was sold a few years ago. French luthier Maurice Dupont restored it to Selmer specifications using a 50‑year‑old piece of spruce and also replaced the fingerboard. 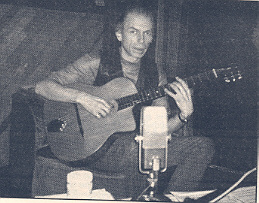 Although the guitar is no longer in its originai condition, it is one of the only Selmers that Diango Reinhardt unequivocally owned and played. Selmer produced guitars between 1932 and 1952. 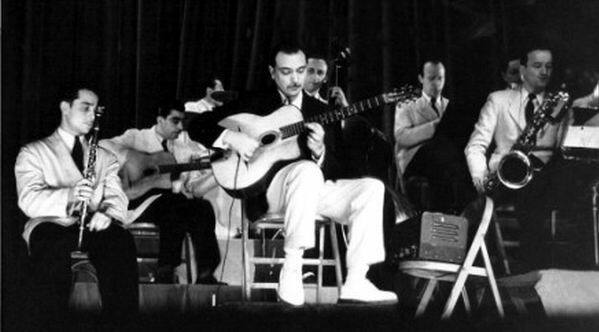 Although they produced a wide variety of instruments, they are particularly known for the 'Modèle Jazz' ( changed to 'Modèle Django Reinhardt' later), made famous by Django Reinhardt. The guitar was initially designed by Mario Maccaferri, with a 12-fret neck and a D-shaped sound hole. 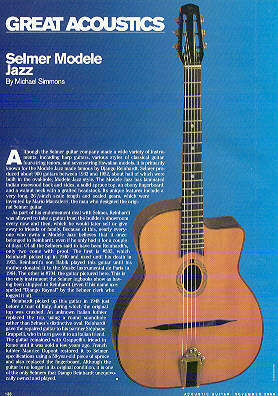 When Maccaferri left the company, Selmer made some changes to the model, most notable the introduction of the oval sound hole and the lengthening of the neck to 14 frets. Almost all Selmer guitars were made of laminated Indian rosewood with walnut necks and an ebony fingerboard. The tops are solid French spruce, what defines the sound of the guitar the most (besides the player). 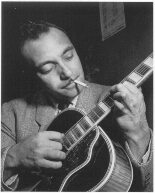 Django Reinhardt got an endorsement deal with Selmer, so many Selmer guitars passed his hands (he sold or gave away a lot of them). 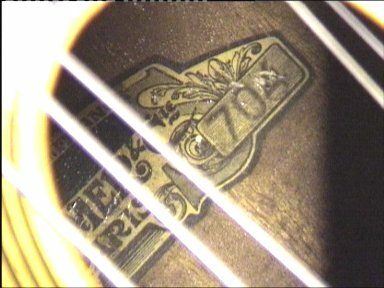 There are 2 guitars that we are sure of belonged to Django: n°503 and n°704. 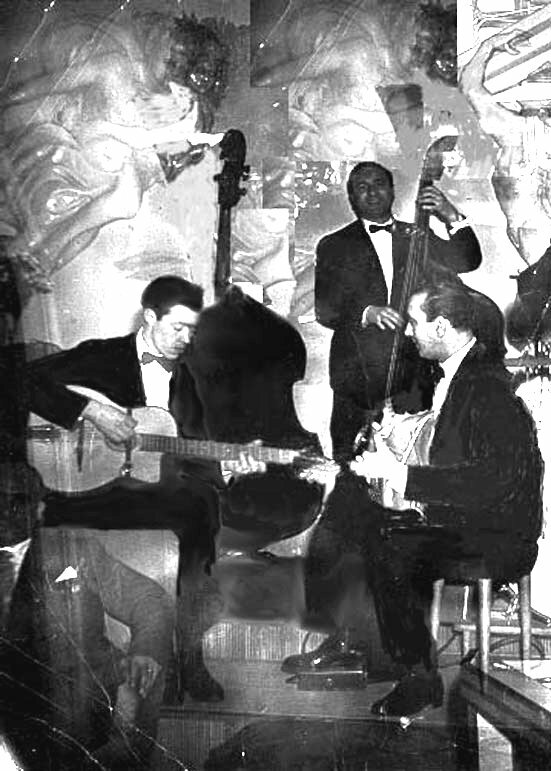 N°503 came in Django's possession in 1940 and he played it until his dead in 1952. The guitar was on display in the Musée Instrumental de Paris, Alas now removed - see Ade Holland anecdote. N°704 came into his possession in 1948, just before a tour in Italy. The top was crushed during that tour and replaced by an Italian luthier. Focusing on his music after 1947 when he returned from the USA having played with Duke Ellington, we also include a valuable recording made at the RDF radio studios possibly for a film soundtrack and skillfully re-mastered by AVID's own sound engineers. 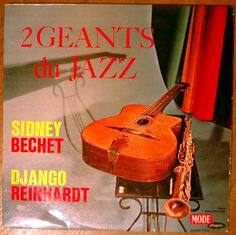 Django's music in the 1950's underwent many changes as witnessed among these tracks. We travel through small group swing to bebop influenced modern harmonic and rhythmically conceptual pieces, urgent, wild and frantic as detected in his amazing guitar playing!